Royal Caribbean Cruise Line(RCL) is upping the ante on what it means to thrill and chill on vacation with the details of their new Perfect Day Island Collection, a series of unrivaled private island destinations around the world. The first in the collection, Perfect Day at CocoCay, Bahamas will boast many incredible experiences, giving adventurous vacationers more to look forward to when setting out on vacation. From racing down the tallest and most thrilling waterslide in North America or riding the tide of the Caribbean’s largest wave pool, to taking in the highest view in The Bahamas from a helium balloon 450 feet in the air, unwinding at the largest freshwater pool in the Caribbean, or enjoying the perfect beach day, guests will have the power to create their perfect vacation day – no matter what that may look like. 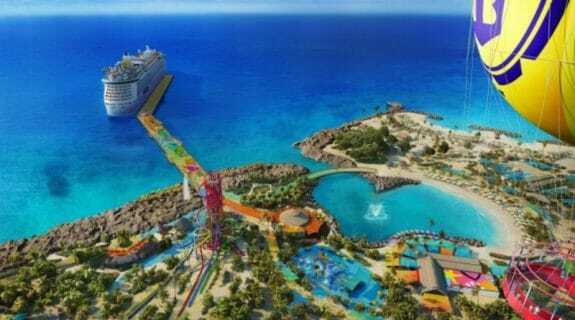 Scheduled to be completed in fall 2019, the new Perfect Day at CocoCay will deliver the ultimate family destination in the Caribbean with the perfect combination of thrills and chills for everyone. 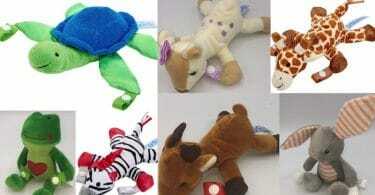 They are coming at this from all sides to ensure every traveler has a space on the island dedicated to them! Over the years the cruiseline private island has evolved from a place where vacationers could enjoy a bbq’d lunch while playing in the sand and surf to a luxurious experience complete with private suites and island adventures. RCL’s ‘Perfect Day’ experience will start as soon as guests step off the ship. 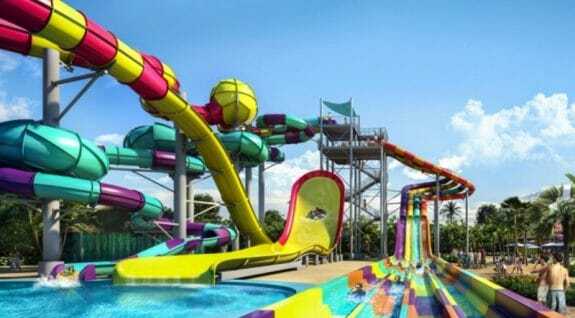 Vacationers will be able to jam out to a welcoming party of live music or brave a zip line ride soaring across the harbor; get soaked by more than 30 water cannons on a shipwrecked Galleon or by the surprising spout of Sprayaway Geyser, spraying water 82 feet in the air. 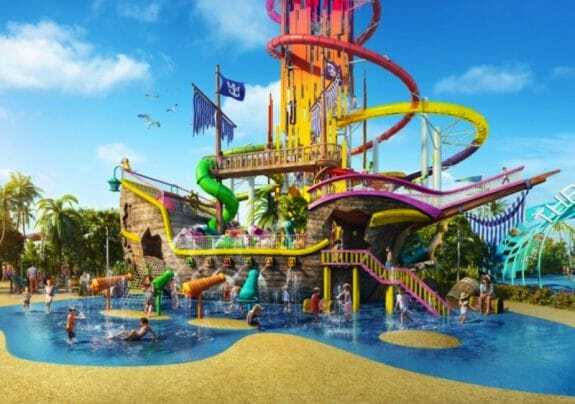 Royal Caribbean’s largest Splashaway Bay will give kids even more buckets of fun thanks to fountains, pools, sprinklers, geysers, water cannons and whirlpools – plus five kid-size waterslides and two massive drench buckets. At Captain Jack’s, the island hangout and meet-up spot, guests can grab a drink at the rowboat bar and enjoy waterfront views or chow down on chicken wings and crispy steak fries – the house specialty. For a nautical, world-traveled vibe, guests can opt to head to Skipper’s Grill for lunchtime favorites like burgers, sandwiches, tacos and salads. Adventure seekers of all ages can also ride the tide at the largest wave pool in the Caribbean, and leave their cares on land as they soar above Perfect Day at CocoCay on a 1,600-foot zip line – ending with the only splash water landing in the region. At Adventure Pool, little adventurers will find an obstacle course with lily pads, a rock-climbing wall and swing ropes to bounce, climb and swing to their heart’s content. Oasis Lagoon will be the Caribbean’s largest freshwater pool where Sunbathers can make their way through three distinct coves, each with a vibe of their own. Guests can splash right in at the kid-friendly beach entry, sip a frosty Coco Loco at the swim-up bar before catching some sun rays on one of three mini swim-up islands with in-water loungers, or treat themselves to total relaxation in a private cabana, complete with its own cabana attendant. Looking to see the island from above? Up, Up and Away will allow guests to drift 450 feet above the island in a colorful helium balloon. Be sure to bring your camera this is the highest vantage point in The Bahamas. The sure-to-be iconic attraction will be visible from anywhere on the island as well as ships docked in port. Chill Island will feature pristine, crystal-clear tropical waters and white powder-like sand, making for the perfect day at the beach. Chill Grill, the largest dining venue on the island, will offer beachside dining with fresh bites. Here guests will find some adventure favorites like wave runner excursions, boat tours, snorkeling to see the spectacular marine life, as well as plentiful cabanas and daybeds for relaxation under the shade. Guests looking to get competitive can visit South Beach where they can play volleyball, beachside basketball, soccer, paddle boarding, glass-bottom kayaking and zorbing in an inflatable zorb ball. Afterwards, grab a bite at the Snack Shack or wade out to the floating bar to cool off with a drink. Those looking to just relax can do so in the teepee cabanas, as well as daybeds, which are perfect for napping and snapping in the shade. At the exclusive Coco Beach Club, travelers can experience an upscale, authentic Caribbean vibe. The first and only overwater cabanas in The Bahamas will offer discerning guests a new level of laidback luxury. You’ll want to stay a week in the overwater hammocks. The cabanas will also come with a waterslide and private attendant, guests will have everything they need for a few hours of complete indulgence. In addition, beachside cabanas and daybeds will offer up a private slice of paradise. There will also be a freshwater infinity edge pool and bar, spanning an expansive 2,600-plus feet. An exclusive dining venue that serves up freshly made Mediterranean fare with a side of ocean views will round out his perfect section of the island. Perfect Day at CocoCay will roll out in phases, beginning Sept. 2018 with the completion of the pier, and the majority of the island will launch spring 2019. Coco Beach Club, the final experience to be completed, is set to open Nov. 2019. Additional Perfect Day Island Collection destinations in Asia, Australia and Caribbean will be announced at a later date.